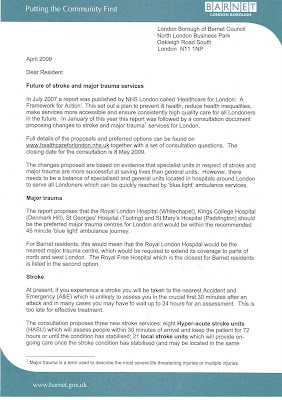 Most residents should have received a letter from Council Leader Mike Freer with important information about the future of stroke and major trauma services in London. 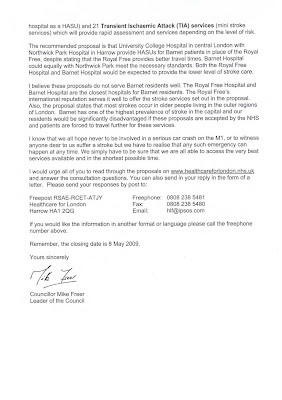 Healthcare is such an important an issue that the letter from Mike Freer was welcome, irrespective of any political motive for sending it. However, it was also an abject lesson in how not to do something. The first lesson you are taught in Marketing School is KISS - Keep It Simple, Stupid (or, more politely, keep it short and simple). The letter that was sent out was two pages long and far too detailed. It should have been written in the style of a tabloid newspaper story - big headline, some diagrams and simple to understand copy with clear instructions as to what we all need to do. The envelope should have carried a simple warning message about strokes so that we would be more inclined to read it. Instead it said “An important message from the leader of Barnet Council”. How many people will have thrown the letter away without even opening it, thinking it was party political propaganda? Barnet spent over £400,000 on its Press & PR Department last year. Perhaps instead of giving cushy jobs to the leader’s chums, the council could instead appoint people who actually know what they are doing.